Running a successful electronic trial is a challenge that your predecessors did not have to face. But with proper coordination between litigator and technicians, success can be assured. This white paper reviews everything you need to know about successful litigation in the digital age. 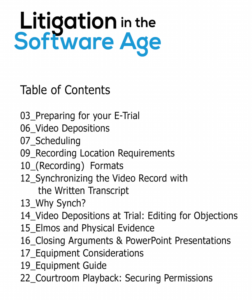 From preparations and video depositions to equipment recommendations and securing permissions, this guide is a must-read for all litigators. Click to download. You will be asked to verify your email.